Step 1: Get rid of the snow. Sounds easy enough. Clear any snow accumulations using a shovel, broom or snow blower. Lets face it, you cant just throw salt on 8″ of snow and hope it melts. Step 2: Apply it right. If you have one, use a spreader. 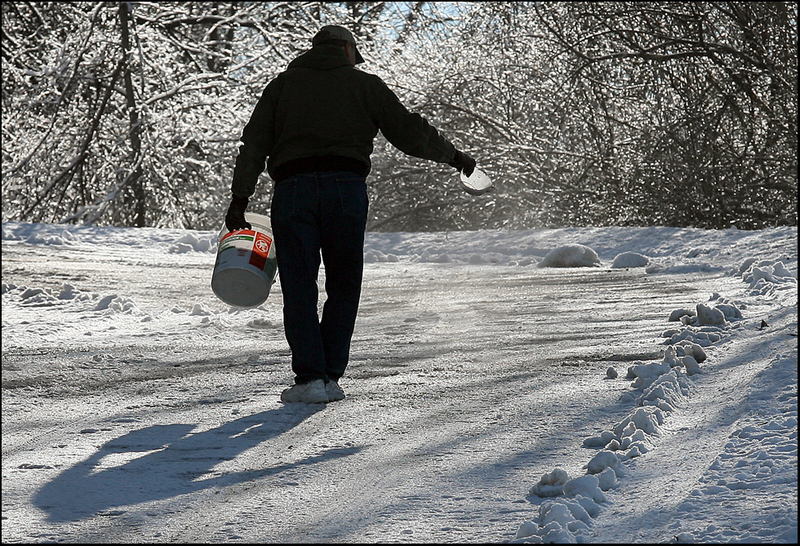 A fertilizer spreader with wheels or handheld spreader ensures that you apply ice melt in a thin, even layer. Rinse the spreader between uses. Or sprinkle it on using an old coffee can with holes punched in the bottom. Always wear gloves if applying by hand. If you apply too much spread it out with a broom. Step 3: Protect concrete, grass and shrubs when melting ice. Most of the damage to concrete surfaces is caused by using too much ice melt and, especially for concrete, the freeze/thaw cycle that they’re subjected to. If your concrete is less than a year old, its not recommended to use rock salt or magnesium chloride products. Follow the application amount on the packaging. If you’re concerned about surface damage, consider kitty litter, playsand, or sawdust. Avoid spreading ice melt close to plants and shrubs and getting too much on your lawn. Step 4: Protect your family and neighbors. Ice melt pebbles are most commonly brought into the house by winter boots and shoes. If you have small children or toddlers, be sure you are cleaning off your shoes before coming into the house. If anyone ingests ice melt, call 911 or the American Association of Poison Control Centers (800-222-1222). before visiting the ER because they’re equipped to handle these exposures. Step 5: Protect your pets. Pets can develop dryness and irritation on their paws and skin if they walk through ice melting products. Pets can also develop mouth irritation if they eat the chemicals or the resulting water. Consider using a salt-free ice melt that is safe for pets.